Cooking with my Mom in the kitchen is something I remember doing as a child. In fact, when we were school-aged my sister and I were in charge of a few suppers a month. I know its an important skill to give my son, but its not always easy to have a 3 year old kitchen helper. Often times it means something takes longer and creates much, much more mess. As winter approaches (say it isn't so), I know I won't be able to sent my son outside to play while I cook in the kitchen like I've tended to do this summer. (Love that I can see his sandbox from my kitchen window). So I've been trying to be intentional about having him help while I cook. 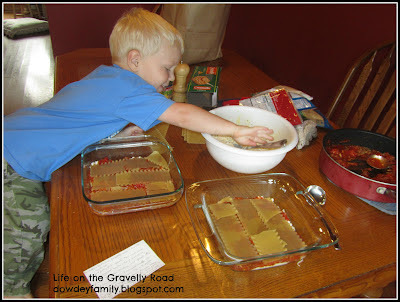 The other day I was making a big batch of lasagna for the freezer and we had a blast working on it together. Besides the normal stirring and measuring help, he really enjoyed helping assemble the lasagnas. Pattern practice (meat sauce, noodles, cheese mixture). Counting rows of noodles. Two yummy pans of lasagna as the result. What a great activity!